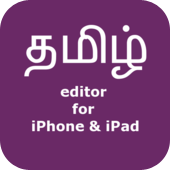 Using the iதமிழ் editor you can create தமிழ் text and share it to the world via Facebook, Twitter, Mail or application of your choice from you iPhone, iPad or iPod Touch. This is a very simple and easy to use application that transliterates the English characters you type into தமிழ் script. The uses guide is built into the application. This application does not use the network for transliterating from English to தமிழ். This version is a major improvement from the first release and it lets users express themselves on social networking sites or send emails directly from iTamil for iPhone.